Last time I discussed the misuse of reports. Today I would like to focus on another item I come in frequent contact with during training sessions or implementations: the template. I’ve created dozens, maybe even hundreds, of Schedule templates in my time as a consultant. Based on that knowledge, I want to share some common issues I notice within organizations. I hope you will take into consideration the three items below and see if they apply to your organization. Most of all, I hope you will be able to improve based on this article. Please let me know if you have additional advice, agree, or disagree in the comment section. I often come across organizations that have made their own start with Project Server. They might have had some help from us or another partner in the past, but mostly I hear from these companies because they want to migrate their EPM 2010 or 2013 to Project Online. One of the things that always puzzles me is the fact that when I pick up their schedule templates, they haven’t changed since the time they were created. How do I know this? Well, the project start date set in 1-1-2013 is always a sure giveaway. I also often see the old layout Project used to have in 2003 or 2007 is still set in the template, giving rise to the question of whether the template was even changed in 2013. An organization is in constant motion. New revelations will change how an organization does their main processes, or new technology might speed up some elements of a schedule. Just think about it: five or more years have gone by and Project Managers are still working with an ancient version of a template! Update the project start date (in the ribbon → Project → Project information). Did you use the template that was provided? What went exceptionally well in your project that made you change the schedule? What went exceptionally bad in your project that made you change the schedule? In regards to the previous two questions: do you think it likely that a next project will face some of these issues? Based on what was said, do you think we need changes in the template? Or to even create a new template? Update the schedule template based on the meetings and the information gathered. This will ensure that the template holds more relevant data, and is more in tune with the times we live in. The upsides are probably clear: less work for the PM to get going with his schedule. A better understanding of what’s happening with the projects in general. Most templates I build are created from a single scenario situation. The organization almost always has a clear understanding of their project management processes and how they want their projects to be run. Each option changes the number of actions (tasks), timespan (duration), and resources (costs/hours). Typically, only the European tender scenario will be in the template, which forces the PM to create tasks, delete other tasks, and maybe rethink dependencies in the schedule. Why not use the functionality of “Activate/Inactivate Selected Tasks”? This feature will give you the option to work out each scenario that you can think of in the template and inactivate the scenario’s that are least likely to happen, resulting in a lot more flexibility in the schedule. 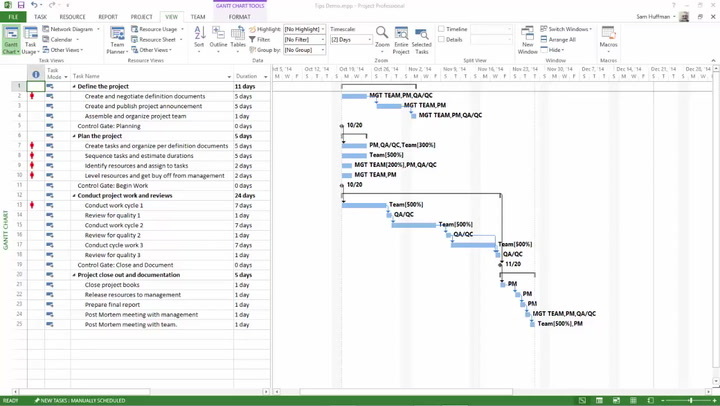 Sure the schedule will grow a bit bigger because there are more tasks in there, but the PM can easily filter a view to show only Active tasks. This gives a nice overview of the current schedule. Consider creating a “Scenario’s view” to show the inactive tasks and then hiding them from all other views. Templates usually get created the first time people see MS Project. At that point in time, their knowledge was probably centered only on tasks. Just starting out, there might be two resources that they know of currently that will always take part in a special part of the schedule. Let’s call them Dave and Hank. Let’s imagine Dave and Hank are specialists and the preferred resources. At some point, Dave wins a lottery ticket, and Hank finds a new job that doesn’t blindly put him on every project 😉. What are we left with? A template that contains two resources that always need to be deleted or replaced. Additionally, since they were specific people, there is no relevant information available to guide the replacement data. Instead of creating assignments on specific (named) resources, consider listing generic resource categories such as Carpenters, Plumbers, etc. Another situation might arise once you make the step from MS Project stand alone to Project Online/Server. If you created your template locally and if it holds resources, these resources will become “Local resources” if there’s no obvious server equal for them. In the situation of Dave and Hank, this will mean that because they left the company, they will have no place in the central Resource Pool. If they are kept in the schedules, for whatever reason, reports will show the local resource. Originally this post and the one about reports were one topic I wanted to cover, but as I started writing, the post grew and grew. I bet that there still is a lot unsaid about these subjects, so I welcome all contributions to the topic. Please add something in the comments below. I’ll be back again soon with a Wrap Up post containing insights on the Common Issues in Project Management that I’ve been discussing along the way. I’ve seen templates and endless template revisions used as a way to avoid the elephant in the room – skill and ability deficits. I have a colleague who says “a fool with a tool is still a fool”. Templates are a great boost for new PMs, a memory jogger for the experienced, and a huge time saver for everyone. We currently have WBS snippets setup for PMs to assemble based on the patterns of work (scenarios) in the project. It seems to be popular with staff regardless of their skill/experience levels. Our organization uses a template starting point for every new project. And while I agree that templates should never contain local or enterprise resource names, we do use local resources predefined in the template to identify the common roles required for each project. For example, our local resources are PM, Solution Architect, Business Analyst, QA Tester. These local resource roles are pre-assigned to the correct template tasks. Then, when the actual resources are identified, the schedule owner simply adds the enterprise resource and replaces the local role. For example, Bob replaces PM. This approach ensures that resources filling these roles are automatically assigned the correct non-project specific tasks with minimal effort. Erik, a useful and interesting article. In my work I like to add the value of a template in promoting consistency of project structure. If an organization uses a methodology with a standard for stages or phases, reporting milestones, etc. the template is an obvious place for establishing these. You can also include custom fields in the template so that you have task flags or grouping values for standard view management. PMOs usually get the idea very quickly even if there is a caution about not telling PMs how to do their job! Daryl, I would suggest that you use enterprise generic resources for your common roles in your template. In this way, you eliminate having local resources in your file. Remember to set the Max Units for the generic resources to 0%. Thanks all for the speedy replies and added value to the post. I think everyone can agree that more insights are always useful.